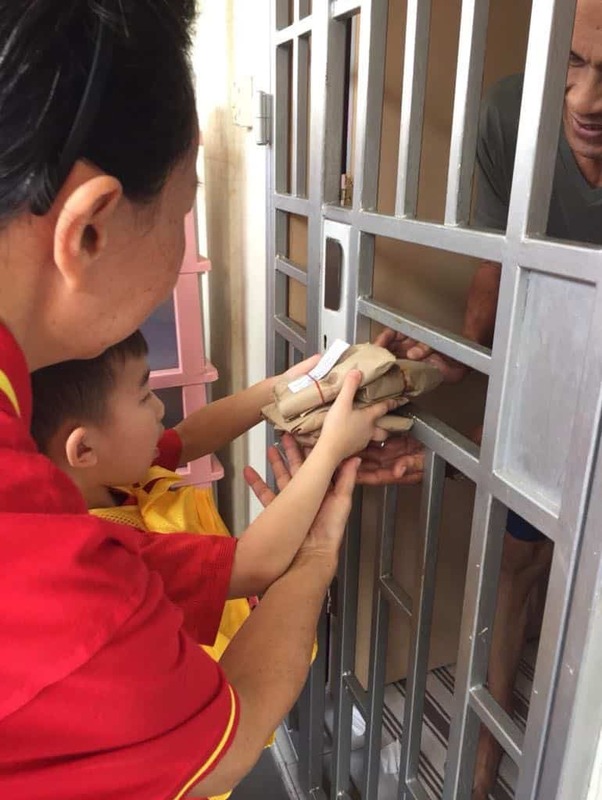 Over the past ten months, Guan Yin Citta Dharma Door Buddhist Practice Center in Singapore, a charity led by Buddhist Master Jun Hong Lu, has distributed free vegetarian food packages to low income families around Lengkok Bahru district in Redhill. The most recent endeavor was on October 21, 2018, and volunteers were positively buzzing with excitement. Each time, there were nearly 50 volunteers involved and 900 packages of nutritious vegetarian food distributed to 350 households for free. Working with local communities, Guan Yin Citta Singapore has been giving kindness and support to these needy seniors. The charity program aims to promote vegetarian life style to local residents and help needy households have access to more nutritious vegetarian diets. Master Jun Hong Lu, the founder of Guan Yin Citta Dharma Door, advocates for vegetarianism as it can develop compassion in one’s heart and change a person’s life for the better. As the Guan Yin Citta Buddhist Practice Center in Singapore is so close to the Redhill area, it’s a good opportunity to serve the community and spread Master Lu’s Buddhist teachings in the district. Residents received complimentary packages of vegetarian food expressed their gratitude to volunteers for their continuous support for the community. Especially for some of the elders, who are eager to adopt a vegetarian lifestyle, but limited by the physical mobility, their need to deliver food to their doors has been fully met. Meanwhile, the regular care from volunteers warms their hearts and gives them hope and spiritual sustenance. 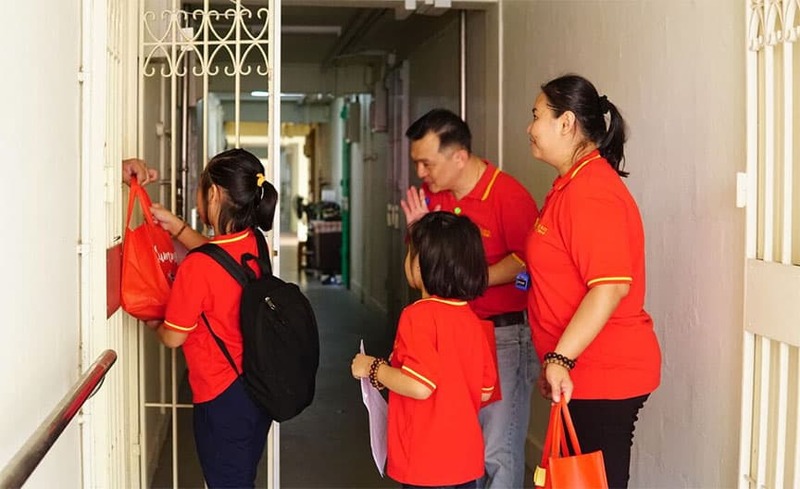 With the genuine caring and assistance, some volunteers handed out some Buddhist learning materials and Master Jun Hong Lu’s books to the residents, introducing them the benefits of Buddhist practice. The volunteers also invited them to visit Guan Yin Citta Buddhist Practice Center for more information. Guan Yin Citta Buddhist Practice Center in Singapore offers daily a free vegetarian buffet with a wide selection of dishes, soups and desserts. Every year before the Dharma Talk by Master Jun Hong Lu in May and the large scale Vegetarian Tasting Event in November, the volunteers normally widely distribute flyers to promote Guan Yin Citta Dharma Door and raise people’s awareness of the importance of Buddhist practice. The altruistic and selfless acts of volunteers come from their aspiration for benefiting others. During these charity activities, they truly live in the essence of Buddhism and breathe in it with purity of mind and sincerity in action. They put Master Jun Hong Lu’s Buddhist teachings into practice—to be selfless and put the well-being of others above oneself. That is where life’s greatest joy comes from. With the dawn’s first thin thread of light made its way through the window, a new day had begun. Volunteers from Guan Yin Citta Singapore started the day with the busy preparation for the Care Package delivery. After checking the inventory and loading them into cars, all the volunteers were off to the destination, the Redhill in Singapore. This seemingly ordinary day soon turned to an extraordinary memory for the residents living in there. On June 3, 2017, the Bukit Merah Community Center, collaborating with Guan Yin Citta Dharma Door Buddhism Practice Center in Singapore, organized a SummeRICE 2017 activity. It aims to provide support and comfort to low income families with the free distribution of Care Packages. Over 100 volunteers from Guan Yin Citta joined this operation. They worked together to do the packing and handed out packages with sincere greetings to the needy families. Every Care Package contained several kinds of dried food, which were convenient for long term use. By applying Master Jun Hong Lu‘s teaching ‘benefiting others benefits oneself’ to practice, the volunteers’ self-devotion actions are remarkable and admirable. This operation demonstrates the Buddhist concept of selflessness, which provides an avenue to social awareness and engagement to the care of low income families. It also shows the act of giving is such a powerful benevolence to bring inner peace and joy. Spreading more love, kindness, and compassion into this world will reward an abundant life with happiness.